I was recommended by a bunch of people to go to Artichoke for amazing pizza in New York City. There are couple locations around the city- I went to the one in Chelsea, right next to two of the hottest clubs: Avenue, and 1Oak. After partying at 1Oak with my sister, we decided to grab a slice at Artichoke right next door to see what the hype was all about. I’ve been to all the best pizza spots in NYC, AND Brooklyn even, so Artichoke had a lot to live up to, and it did not disappoint. I ordered their famous Artichoke slice, and my sister ordered a Margarita slice. I LOVED it. My slice had no tomato sauce, but it had SO much flavor it didn’t need it. 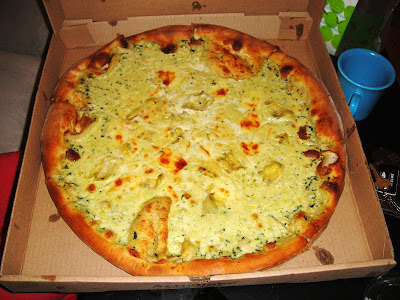 It tasted like a mix between cheese, spinach and artichoke dip and creamy Alfredo sauce all mixed into one sauce with chunks of artichoke. I usually like tomato sauce on my pizza, but the Artichoke slice is so good, I didn’t miss it. The crust was delicious, crispy on the outside and fluffy on the inside. This was definitely one of my favorite slices of pizza because it was unique. It may be a little rich & heavy for some people’s taste, but after a night out it’s damn good. My sister loved the Margarita slice too. I tried it and it was really good- great flavor. Something about the pizza crust in New York, they say it’s the water they use for the bread. It’s just amazing.